What Do a Cow, a Candle, a Clock and Cal Ripken, Jr. All Have in Common? They are all part of the 25th celebration of the life-saving Change Your Clock Change Your Battery® program! It’s hard to believe that in just a few days, we will be changing our clocks back from Daylight Saving Time. This year the time change is on November 4 and it also marks the 25th anniversary of the annual Change Your Clock Change Your Battery® program. Energizer and the International Association of Fire Chiefs (IAFC) are once again working with local fire departments nationwide to raise awareness on the importance of working smoke alarms and carbon monoxide detectors in helping to keep families safe in their homes. Thirty-eight percent of fatal fire injuries occur in homes with no smoke alarms, while 24 percent occur in homes in which at least one smoke alarm is present but fails to operate, frequently due to dead or missing batteries. On Monday, Oct. 1, one week before the anniversary of the Great Chicago Fire that killed hundreds and devastated the city in 1871, the Energizer Bunny® Brigade led by MLB Hall-of-Famer Cal Ripken Jr. “re-created” the O’Leary barn, where by legend, the fire started at an event on the grounds of the Chicago Water Tower, the only building to survive the fire. The story goes that Mrs. Catherine O’Leary’s cow kicked over a candle, starting an inferno that consumed 3.3 square miles of the city. 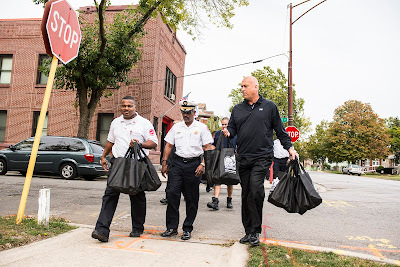 But on this occasion, Ripken and Chicago firefighters demonstrated how advances and educational programs over the past century have made our communities safer so mass fire tragedies can be prevented. Ripken, known as the Energizer Bunny® of baseball for his record of consecutive games played (2,632! ), has worked with Energizer for the past seven years to honor people and programs that celebrate positivity and make a difference. In Chicago, Ripken will lead the first of the neighborhood canvasses with fire officials who will conduct fire safety inspections and distribute Family Safety Kits, stocked with products designed to help keep homes safe including smoke detectors, Energizer® MAX® batteries and Energizer® Weatheready® flashlights. To help give more families those critical seconds, Energizer is honoring its 25th year by donating 250,000 batteries to fire departments across the country to distribute to local families in their areas and adopting 25 fire departments in 25 cities across the nation, who, in addition to batteries, will be equipped with a variety Energizer® family safety products for their department and to share in their communities. Together, they will host Home Safety Days and neighborhood canvasses spanning throughout National Fire Prevention Month in October until the end of daylight saving time on Sunday, Nov. 4. From October 11 through November 4, visit the Energizer Bunny® Facebook page and click on the Fire Safety Info Tab. Here you will have the chance to enter a sweepstakes to win a Family Safety Kit. Energizer will be giving away one Family Safety Kit per day for 25 days. For more information, please visit energizer.com and facebook.com/energizerbunny. So remember to change the batteries in your smoke alarms and carbon monoxide detectors when you set your clocks back this year – it could help save a life! Smoke and heat detectors by electronic control devices are simply the best in the market!